A certificate of good standing should contain your company’s name and date of incorporation or qualification, indicate that it is authorized to do business in the state, certify that the annual taxes have been filed and paid and the Articles of Dissolution or Application for Withdrawal has not been filed. A Corporation / LLC must be registered in one of 50 states of America. Company must be in full compliance with tax filings and obligations. The business has submitted all required reports and paid all required annual or biennial fees with the company’s home state. The business and the owner itself is law abiding and compliant with the state’s laws. The business is not suspended or revoked by the state. Foreign Qualification – If your business is expanding and you want to do business in states other than your home state, a Certificate of Good Standing will be required in order to qualify. Bank Account Opening – Should you wish to open a business bank account, note that some banks require this Certificate of Good Standing. Financing / Loans – Most lending institutions require a company to provide the Certificate of Good Standing to prove that the business is still in existence. Selling the Business – Should you sell the business, you will need to present this document, among many others, to the buyer to convince it that the business is not subject to any form of sanction, suspension, or disciplinary censure. Business Transaction – If your company wishes to get a credit line from a supplier or form a partnership or collaboration, this document may be required to ensure a smooth transaction. Business License Renewal – Most states will require this certification to ensure that the company has adhered to all statutory filing requirements and paid all necessary fees and charges. Investors – Some business partners or investors may ask for this certificate to certify legitimacy of the business. 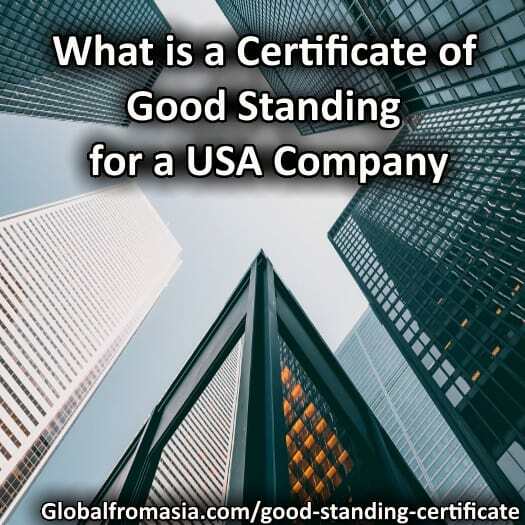 Most states allow business entities to get a Certificate of Good Standing at their respective Secretary of State, with some offered through the Department of Licensing and Regulatory Affairs. Today, this certificate can be obtained online – but it depends on which state your business is registered in. Here we will discuss how to get a Certificate of Good Standing in each state and how much it costs to get it. Read on to learn more. Company details such as: business name, business address, date of incorporation, email address, and contact details. Entity ID/Number issued by the State at the time the entity is formed and registered. In Alabama, a Certificate of Good Standing is called the Certificate of Compliance. This can be requested from the Department of Revenue for a $10 fee. You may also be able to request the document online. If qualified for a certificate of good standing, the requestor will receive an email that will either include a Certificate of Compliance for the entity, or contact information for the Department personnel that handles these requests. In Alabama, the process of determining if an entity is in compliance is currently a manual process, hence most requests take 3-5 business days. Click here to apply for an Alabama Certificate of Good Standing. In Alaska a Good Standing Certificate is called a Certificate of Compliance. You can easily request it online and it will be available for immediate printing for $10 – you can pay using your Visa or MasterCard. If you need a hardcopy, you can submit a Copy Request Form to the Alaska Division of Corporations – this process can take up to 10-15 business days. To pay for the hardcopy, you may make check or money order payable to the State of Alaska or complete the credit card payment form along with the copy request form. In Arizona, a Certificate of Good Standing can be printed online for $45 – that’s a $10 filing fee plus the expedited fee of $35. If you wish to pay only the filing fee, you can go to the Corporations Division and personally submit a Records Request form – here you can save $35 and get your Certificate of Good Standing the same day. A Certificate of Good Standing in Arizona can be obtained online through the official Arkansas Secretary of State website. You only need to type in the name of the business entity and purchase the certificate for $15. This document is also known as a Certificate of Authority/Existence in Arkansas. In California, a Certificate of good Standing is also known as Certificate of Status. This can be obtained by submitting a request to the California Secretary of State’s Sacramento office personally or by mail. If requested personally, the process takes only a day, if by mail, it could take a week or more. A Certificate of Status costs $5 for each entity and filing fee of $5 per document. Payment can be made using Visa/MasterCard or check or money orders payable to the Secretary of State. Getting a Certificate of Good Standing in Colorado can be done online. You simply need to go to the official Colorado Secretary of State website and find your business entity in its database of business records. In the search results, you can quickly see the entity’s status – whether it has good standing or not. If the status is good, the certificate of good standing is readily available for printing upon payment. The fee is $5 for routine, and an additional $15 if expedited. In Connecticut, a certificate of Good Standing is known as a Certificate of Legal Existence. You can obtain this certificate online or you may request it by fax or mail – this process takes up to 5 business days. The cost of the certificate is $50 (3-5 business days) or $100 if you wish to get it within 24 hours. You can pay by check payable to the Secretary of State or with your credit card. In Delaware, a Certified Certificate of Status can be requested at the Division of Corporations. The fee is $50 per certificate for a short form certificate of status or $175 for a Long Form Certificate of Good Standing. A short form certificate basically includes only the name of the company and its current status, while a long form certificate includes more details like the date and time when all the documents have been filed, and any name changes, if any. You can get this document personally at the Division of Corporations in Dover, Delaware or mail a Certification Request Memo to 401 Federal Street, Suite 4, Dover, DE 19901. A document request in Delaware can take up to 10 to 15 days. In Florida, they call it a Certificate of Status, which you can print online. On its order page, it will only ask for your company’s document number – this is a 12-digit number which can be searched by name online here. The certificate fee is $5 to $10 depending on the type of company you own. You can pay using your debit/credit card or using your funded Sunbiz E-Filing Account. If you wish to have a Certified Copy of the Certificate of Status, you may mail a letter of request containing your entity’s name, document number, the date the document was filed with the Division of Corporations and the payment in the form of a check or money order payable to Florida Department of State. The fee starts at $8.75. Ordering a Certificate of Good Standing or Certificate of Existence online in Georgia is as straightforward as it is in Florida. You only need to input your business name or Control number and you can print the document immediately upon payment. The fee is $10. All Certificates of Good Standing in Hawaii are readily available online. For $7.50 you can get this document by going to the official site for the State of Hawaii, click “Purchase Certificate of Good Standing,” input business entity name, review details and hit Add to Cart to complete the purchase. You can get a Certificate of Existence in Idaho by ordering online, personally going to Idaho’s Business Entity Division, calling, or faxing a request to their office. The fee is $11.50 for an online certificate, which is generated and displayed in your browser readily available for printing, or $12 for the official certificate — a certificate with an original signature which can be mailed to you or picked up at the Secretary of State’s office. Obtaining a Certificate of Good Standing in Illinois can be done online using their Department of Business Services database, wherein you search for the business entity you are looking for by file number or name and purchase a Certificate of Good Standing if the entity has satisfied all necessary requirements. You may then print the certificate after the purchase has been completed. There is a $45 fee for a corporation or limited liability company, or $16 fee for a not-for-profit corporation. This can be paid using your Visa, MasterCard, Discover or American Express. In Indiana, they call it Certificate of Existence. You can obtain this document online either in short form ($20) or long form ($30). A short form contains the business name, date of incorporation or qualification, whether the most recent report has been filed, the fact that there is no notice of withdrawal, dissolution or expiration, and the seal of the Secretary of State. The long form contains all the same details but includes a list of all documents that have been filed for the business. Certificate of Good Standing in Iowa are readily available online. You simply go to the official website of the Iowa Secretary of State, search for your business entity, and make a purchase. Fee is $5. To obtain a Certificate of Good Standing (CGS) in Kansas, you must first perform a business entity search to look for the company for which you need the document, click View Record beside the name of the business entity you are looking for, and click Certificate of Good Standing. It will redirect you to the Request and Payment page wherein you have to pay $10. After the payment, a black & white document with the state seal and an electronic certification statement from the Secretary of State will be readily available for printing. In Kentucky, a certificate of good standing is called Certificate of Existence. It can be obtained online or via mail/fax for $10. If you need a certified copy of the document, you will need to complete a Request for Corporate Documents form and submit it to the Kentucky Secretary of State. Copies of documents and certificates on file in the Secretary of State’s office may be obtained by written request, mailed to P.O. Box 94125, Baton Rouge, LA 70804, faxed to (225) 932-5313 or online through the Commercial Database. Fax requests are accepted when a credit card number is supplied. Requests submitted by mail must be accompanied by a check or money order payable to the Secretary of State. Documents may be certified by the Secretary of State as a true and correct copy of the records of his office. The fee for a copy of an individual document is $15. The fee for more than one document filed by the same entity or the complete file for the entity is $25. Certificate of Good standing or Existence in Maine can be obtained online using their Interactive Corporate Services for $30. Maine’s online interface is pretty straightforward. You’ll only need to search for the business entity and you’ll be able to see its status — whether it’s been dissolved or it has good standing. On the same page you can print out the Certificate of Good Standing and pay using your credit card. You can obtain a certificate for a business entity registered with the government by going to the Maryland Business Express website, select Certificate of Status and type in the name of the business entity. Certificates of Status are $20 each. All items incur an expedited fee of $20. Certified Copies are $20, plus $1 per page for the first Certified Copy. Additional Certified Copies are $1 each, plus $1 per page. Non-Certified Copies are $1 per page. All items incur an expedited fee of $20. You can pay using your credit card. Obtaining a Certificate of Good standing in Massachusetts is done online. You will only have to search a business entity on the state’s official Corporate Divisions website. In the search results, click on the name of the business entity you are looking for and click Request Certificate. On the Certificates Dropdown menu, select Good Standing then click add — on this part you’ll see if the company’s status is in good standing or not. The certificate is usually sent to your email upon payment or delivered by mail. Fee starts at $12. It can be obtained at the Michigan Department of Licensing and Regulatory Affairs. Processing time is typically one to two business days. Fees start at $10. As of this writing, online applications for Certificate of Good Standing are not yet available on Michigan’s official website. To acquire a Certificate of Good Standing in Minnesota, simply go to the Minnesota Business Filings website and search for the business entity. In the search results, click on the business entity and click order Certificate. Fee is $15 and you may pay with your Visa, Mastercard or Discover. The certificate shall be emailed to you upon payment confirmation. You may obtain this document by personally visiting Minnesota Secretary of State and submitting a written request and a $5 fee. Certificates of Fact, Certificates of Good Standing/Existence or certified copies of any business filings may be ordered online. To do this, you must have an account on Mississippi’s official website, otherwise you may register. Once logged on, select “Order Documents” at the bottom of the page and follow the instructions. Certificates and copies of most business filings will be available immediately upon payment. Payments can be made by credit card. Order certified documents from the Corporations Division. You can order online or fax your request, attention “Copies,” to (573) 751-5841. To request a copy online, you’ll need to create an account or log on Missouri’s official website. Search for a business entity registered in Missouri and simply click on Order copies/Certificate and pay for a $10 fee using your credit card. To get a Certificate of Good standing in Montana, simply search for your business entity, click Request Entity Information and Request Business Certificates, check Certificate of Fact and input your email address where the document will be sent upon payment confirmation. Fee is $15 and can be paid using your credit card. To obtain this document, you simply need to go to Nebraska’s official Secretary of State online Corporate & Business Search and look for the business entity you need to look for. On the search results, the status of the company is already indicated — whether it has good standing or not. Click on the business entity and purchase a Certificate of Good Standing. The fee is $6.50 that can be paid using a credit card. This certificate is available for immediate viewing/printing from your desktop. A Verification ID is provided on the certificate to validate authenticity online at the Secretary of State’s website. There are four ways you can obtain a Certificate of Good Standing in Nevada: order online, order by mail, via email and via fax. To order online, you should have an account on Nevada’s official Business Registration website, otherwise you may register. To order by mail, Send a letter with the name of the entity for which you are requesting the certificate, along with a check, money order, or credit card authorization for $50 made payable to “Secretary of State.” To order via email, send a detailed request, along with credit card information, to [email protected] To order via fax, fax a detailed request, along with credit card information to 775-684-5645. You can get a Certificate of Good Standing in New Hampshire by coming to their office at State House Annex, Room 317,25 Capitol Street, 3rd Floor, Concord, NH 03301. Fee is $5 and processing takes up to 14 business days. If you wish to get it faster, you may pay an additional $25 expedited fee. There are three types of standing certificates: short form standing ($25), long form standing with officers and directors ($50) and long form standing with charter documents ($100). These document are readily available online upon payment at the New Jersey’s Business records website. Certificates may be requested and obtained online at https://portal.sos.state.nm.us/BFS or by mail with a completed Certificate of Good Standing Request Form and appropriate payment. Fees start at $10. Obtaining a Certificate of Good standing in New York can be done by submitting a written request with the New York State Department of State, Division of Corporations, One Commerce Plaza, 99 Washington Avenue, Albany, NY 12231. You may also fax the written request to (518) 473-1654. The request must include details like the exact name of the business entity, exact date of formation, preferred process (expedited or routine), and the mailing address of the certificate. Fee is $25 and can be paid using a credit card by also attaching a Credit Card/Debit Card Authorization Form on the written request. You can get a certificate of good standing in North Carolina by submitting a written request that is signed by a current officer/partner of the entity. You can submit this via mail to North Carolina Department of Revenue, P.O. Box 1168, Raleigh, NC 27602. You may also fax it to (919) 733-5750. The fee is $15. Normal processing takes up to 4 days. Currently, obtaining a Certificate of Good Standing/Fact is not yet available on North Dakota’s Secretary of State official website. However, you may check an entity’s status online using its Business Records Database. Here you can quickly check whether an entity has good standing or not. To get a certificate, you may call the Business Division Secretary of State at 701-328-4284 or 800-352-0867 (Ext. 328-4284). You may also fax a written request at 701-328-2992 addressed to the Business Division, or email it to [email protected]. You may also mail your request to Business Division, Secretary of State, 600 E. Boulevard Ave. Dept. 108, Bismarck ND 58505-0500. The fee is $15 and $5 for a Search of Records Fee. You may obtain a Certificate of Good Standing in Ohio online using the official Secretary of State’s website at www.sos.state.oh.us. Note that the website is encrypted and cannot be accessed outside the US – the only way to do this is by using a VPN. To obtain a certificate, search for the business entity by name or by Charter/Registration Number and purchase a Certification for $25. Getting a Certificate of Good Standing in Oklahoma can be done online using its official Secretary of State website. To get started, search for the business entity from Oklahoma’s Business Database. Once found, click on it and Order Documents – you’ll be asked for an email address where the certificate shall be sent upon payment confirmation. Payment is $20 payable with your Visa, MasterCard, American Express and Discover credit cards. To obtain a Certificate of Good Standing in Oregon, you must complete a Request for Certificate form and fax it to 503-378-6520. Requests are processed in the order they are received and within three business days. The certificate can be picked up in person, by mail, or may be faxed back to you. This document costs $10 and is payable with MasterCard, VISA, Discover credit/debit card or through check/money order payable to Corporation Division. You may obtain a Certificate of Good Standing in Pennsylvania by reaching the bureau by telephone at (717) 787-1057, option 3. The phone lines are available from 8:00 am to 4:45 pm. You may also visit the Secretary of the Commonwealth to request the certificate. Currently, getting the document online is not yet available on Pennsylvania’s official website. You may get a Certificate of Good Standing at Rhode Island’s official Business Portal. For non-profit entities, the fee is $7, and $22 for all other entities. Processing time is 2 business days plus mailing time. If you wish to get the certificate in person, you may go to Division of Business Services, RI Department of State, 148 West River Street, Providence, RI 02904. Your request can be made at the public counter and the fee is $5 for non-profits and $20 for all other entities. If you wish to get it via phone, you may call at (401) 222-3040 – processing time can take up to 2 days. You may also mail your request to: Division of Business Services, RI Department of State, 148 West River Street, Providence, RI 02904-2615. This process can take up to 5-7 business days (including mailing time). To get a Certificate of Good Standing in South Carolina, you must submit a Online Document Request and mail it to South Carolina Secretary of State Attn: Corporations Division 1205 Pendleton St, Ste. 525 Columbia, SC 29201. Fee is $10 that can be paid via check. Getting a Certificate of Good Standing in South Dakota can be done online. Anyone can request a Certificate of Good Standing/Existence for any business entity registered with the Secretary of State in South Dakota EXCEPT for General Partnerships, Reserved Names, Registered Names and Doing Business As (DBA)-Business Names. To get started, you need to look for the business entity using South Dakota’s Business Information database and pay a $20 fee using your Visa, MasterCard, Discover, or American Express debit or credit cards. Anyone can request a Certificate of Existence using Tennessee’s Secretary of State official website. Simply identify the appropriate business, enter the Secretary of State Control Number and click ‘Begin.’ If you do not know the business entity’s control number, you may look for it on the Business Information database. Once found, it will lead you to a page wherein you have to input your name and mailing address and will require a $20 filing fee. Upon payment confirmation, you’ll be able to download and print your Certificate of Existence in PDF format. This document can be requested by mail, fax, e-mail, Internet or in person. Phone requests will not be accepted. To get started, you must accomplish a Division of Corporations & Commercial Code Order Form. It comes with 2 options: Short Form – $12.00 (One page document that indicates that the business entity exist and whether it is in good standing) and Long Form – $20.00 (indicates the existence of the business entity, whether it is in good standing, and all restated articles, amendments to date, if any). You can pay using your Visa, MasterCard, or American Express. A Certificate of Good Standing can be obtained quickly through Vermont’s Online Business Service Center. Simply search for the business entity and pay the $25.00 filing fee by credit card or e-check. To obtain a certificate or a copy of a document by mail, please forward a written request to the Clerk’s Office with a check payable to “State Corporation Commission” for the appropriate fees to: Clerk’s Office, State Corporation Commission, PO Box 1197, Richmond VA 23218. Fee is $6. To obtain a Certificate of Good Standing in Washington, the best way to do it is to visit the Corporations Division at Dolliver Building, 801 Capitol Way South, Olympia, WA 98501. You may request for a Certificate for $20. If you want to speed up the process, you may choose expedited service for $50. You may order a Certificate of Good Standing in West Virginia through the Request for Certificate of Existence/Authorization website and pay $10 using your credit card. You may also complete a Customer Order Request form and submit it personally to the Business & Licensing Division. You also have the option to email it to [email protected] or fax it to 304-558-8381. You can pay by cash, credit card, or money order. The Office of the Secretary of State processes requests for Certificates of Good Standing. You may visit their office at B41W State Capitol, Madison, WI 53703. Requests may take up to 3 to 5 days and require a $10 fee. To obtain a certificate of Good Standing, go to Wyoming’s Business Center and search for the business entity by inputting its Filing ID. If you don’t know the entity’s Filing ID, you may look for it in this page by name. Once the Filing ID is obtained, go back to the Business Center and type it in, the Certificate of Good Standing shall be quickly available in PDF format with no fees to pay.